There are so many movies and series! It's hard to decide what to watch, or to remember what you've seen and what videos you own. 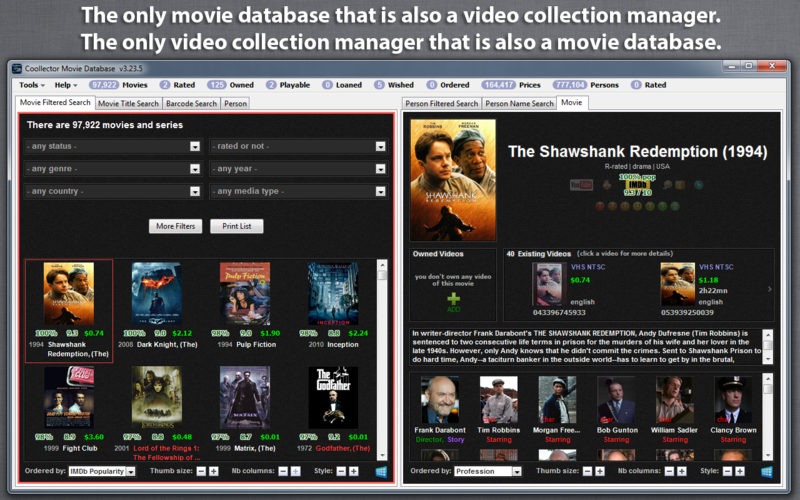 Coollector Movie Database can catalog your collection of DVDs and video files, efficiently and beautifully. It can also analyze your taste to predict how much you'll like a show. You instantly know if a show is worth your time or not, and you'll discover some great shows that you would have missed otherwise. NETFLIX, HULU, and AMAZON PRIME: browse their catalogs of streaming movies and series to evaluate if it's worth subscribing to their service, or if you're already subscribed, decide what to watch now. This software is completely FREE to use. No crippled features and no time limit. There's only a 30 second nag screen on startup that you can remove by getting a license. This is NOT freeware like they say, it's NAGWARE read there own description. cool idea but not well pulled off in my opinion. Downloaded, installed took look around and one look at the useless data base that is full of stuff I will not buy/order/rip to add to my collection is unwanted visual BS. To add to the database I might as well be using a spreadsheet for all the lack of functionality that this program has allowed the user. Recommendation is do not bother with this program. It has some nice filters, the least of which will keep track of the curent price of the desired format.